Yeah thanks for the feedback. I figured compressing “our gas” was not really feasible or everyone would be doing it instead of making it on the go as it were. I am looking forward with getting the pieces put together for a modified simple gasifier to a e/g. Sealable 5 gal bucket ordered and on the way. going in to Lowes and O’Reillys this afternoon to pick up some plumbing parts. I am having trouble choosing a nozzle configuration perhaps with a grate and firebrick tip. So many options that work. HA HA Anyone know how much pressure inside the simple after it gets going. Seen some warnings on backfire explosion and wondering how to incorporate a safety valve. pressure inside the simple after it gets going. The inside of a gasifier will be under a mild vacuum. Of course the vacuum of a large engine could crush a tin pail. Less pressure than atmospheric. Ok I did not expect that. I thought it would be a positive pressure. Thanks for the feedback Jeff. Compressing the wood gas as it’s generated before sending it to the engine’s intake is more likely to work. There are numerous issues with compression. It is doesn’t have the energy density does like propane. The compression for CNG and propane is extremely high and without special compressors with the proper seals it leaks, and can start a fire or explosion. I have seen some people do it on youtube video’s with an air compressor but doesn’t end up to be worth the effort. They were getting like 15-20 minutes of runtime with a 100gal propane tank on small generator. I would try gary gilmores simplefire on your lawnmower to kind of get the hang of things. I would get Wayne’s book, there is a lot of useful information in it, If you are going to chunk stuff up at a jobsite. It would work, if you are going to use your current chipper, it just isn’t designed for chips. The other option is to buy/make something like Thrive Energy Systerm gasifier which is built more for wood chips, And it has central heat and power. (all power labs GEK is similar) Then wait for or build your own electrified/hybrid vehicles. (I believe by 2020, chevy and ford will have something for light trucks.) There are some aftermarket hybrid kits as well. I get it has an extremely high upfront cost and may seem unobtainable right now, but I don’t believe that will always be the case. As always it depends on your knowledge and skillset what will work best for you. That, or figure a way to compress wood gas up to maybe around… 25-30 psi before delivering it to an engine’s air intake to mix with air at the ideal ratio. I figure an engine-driven centrifugal compressor or blower of a certain size(a small one) would do satisfactory without taking much if any noticeable engine power to spin over. Figuring out how to bolt it to the engine, attach the belt to it, and the rest of the works is what’s needed to be figured out. 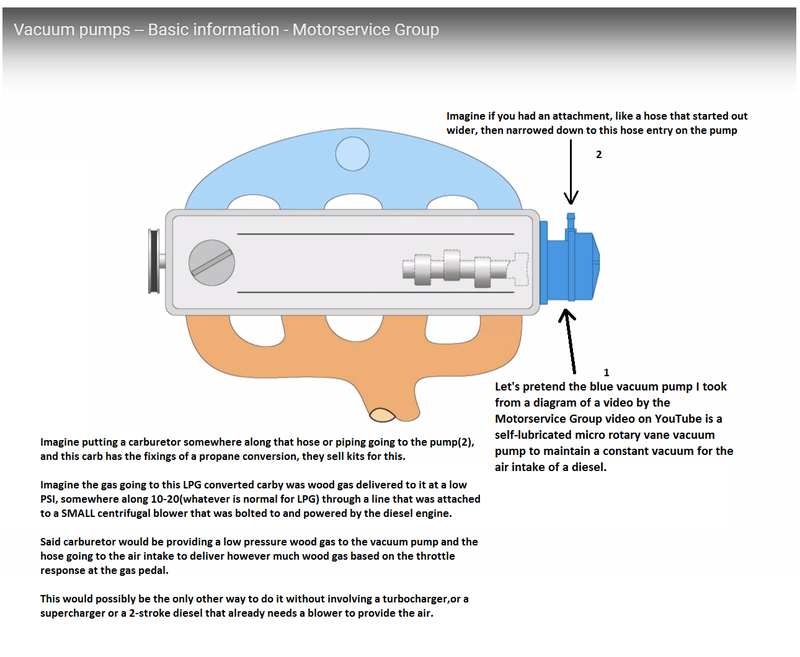 If you bump up the gas pressure, you have to bump up the air pressure as well unless you are doing direct injection, or else the gas would go out the air intake and/or you would never draw any air into the cylinder. Agreed, hence why using turbocharged diesels would make this far more easy to apply. 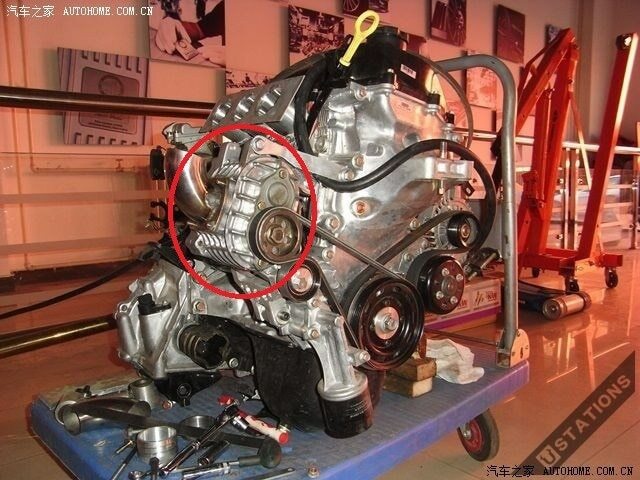 Another approach is if you found a way to maintain constant vacuum at the intake, at least 11 inches Hg vacuum, then delivered it to a throttle system like a carburetor or something attached to the said intake. I was thinking similarly at first hence why I put the ideas forward, except they use propane at a certain PSI regulated to go into a carburetor like liquid gasoline does with a naturally aspirated intake for an engine with a constant vacuum at a certain vacuum pressure, I’m suggesting that using a means to maintain a constant vacuum at the intake of a diesel engine and that vacuum being of a certain amount of vacuum pressure, or turbocharging the diesel would allow this same effect, as long as you made the throttle system or carburetor like device work with that diesel’s intake once either one is established. I am not sure if i am following you there. As the rpm changes, or the load changes, the governor reacting… the different rpm’s, the different loads, they all have a different vacuum, not proportional to the rpm. Installing a lobe compressor with an adjusted rpm to overpressure ratio, both sucking the air and generating vacuum on the gasifier, works great. But i am always keen to learn something new, if you please can elaborate on your idea. If I can draw an example, I’ll draw it and see if I can post it here. I am a bit lost. What is the purpose of the compression? Originally I thought it was to store woodgas for future use, now I think we are talking about compressing it on the fly… Is this for constant draw from the gasifier? YES, I was saying that would be more practical than storing it for later use and I seem to have drawn some confusion, I’m making an MS Paint Concept for what I’m talking about. Coal gas would have the same issue. But what you are doing is really trying to smooth out the draw from he gasifier. 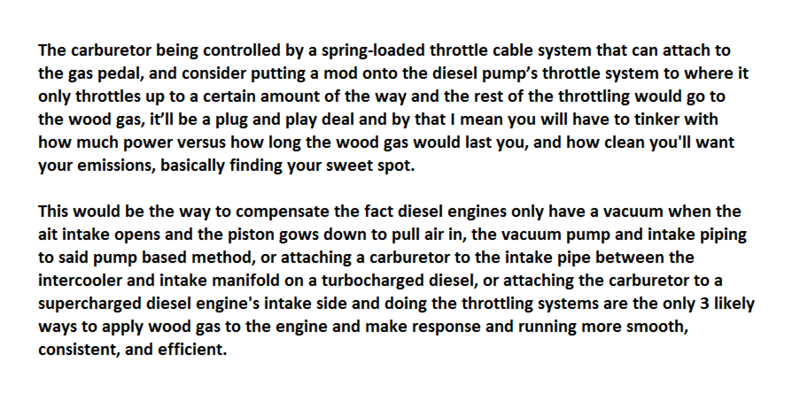 There was a long discussion on how to do this at one point, and a couple of solutions that were far simpler then a turbocharger. Here are the pics I posted on the converting diesels to woodgas thread, I’ll use them along with a third image dedicated to this topic here. Folks, instead of trying to compress wood gas in bottles or tanks, read these pictures and see what you think of this set of ideas. 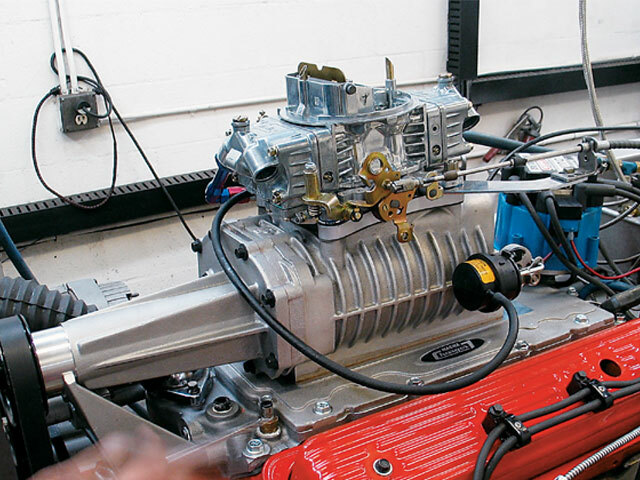 By three systems, I was referring to using either this one, a supercharged, or a turbocharged diesel to attach a throttle or converted carburetor to. Notice the carburator at the vacuum side of the blower ? Next is a small lobe blower, some models of Toyota use them standard, they can run up to 15 000 rpm and deliver 1,8 bar. I want to use one just to create suction on the gasifier with a slightly overpressure towards the engine suction.